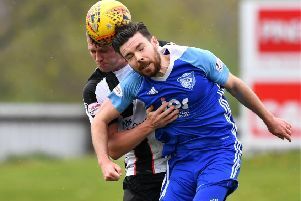 Peterhead suffered their first league defeat in eight and lost ground on league leaders Montrose after a dramatic finish against Clyde on Saturday. The game, a scrappy affair, looked destined to finish goalless until the dying embers when David Goodwillie struck from close range on 85 minutes to hand the hosts a priceless victory and consign Peterhead to a second defeat in the space of a few days after the Scottish Cup loss to Dumbarton last Tuesday. The conditions played a huge part in proceedings from the off with the swirling winds and heavy showers pretty much spoiling the game as an attractive spectacle. The first half was a tale of two chances, one for each team. Clyde were quickest off the mark and created the first meaningful opportunity when Aaron Millar ran onto a Goodwillie ball. The youngster forced Peterhead goalie Greg Fleming into a good stop down to his left. The visitors then nearly made the breakthrough on the half-hour mark when the left-sided Jack Leitch was found in space by the returning Rory McAllister. Leitch rolled the ball onto his left foot and sent a shot whizzing past the far post. It was the closest thing that the first half got to a goal, and even then it came after a series of ricochets rather than incisive Peterhead attacking. The Blue Toon did start the second half menacingly though and had the ball in the back of the net minutes after the restart. Jordon Brown tapped in after Blair Currie had initially made a top save from Russell McLean, but the assistant referee adjudged Brown to have been in an offside position. Asked about the incident after the game, Brown insisted that his teammate should’ve scored. Brown’s disallowed effort was as good as things got for Peterhead in the second period. As Clyde’s midfield started to win all of the contests in the middle of the park, it was no surprise that the Bully Wee were creating all the chances. The industrious Mark Lamont had a long range effort parried away well by Fleming but the goalkeeper was soon picking the ball out of the back of his net. Barry Cuddihy was the supplier, his chipped ball finding Goodwillie in space and the forward made no mistake prodding under Fleming to break the deadlock. In truth, it was a dismal afternoon for Jim McInally’s side who had scored 24 goals in their five previous matches. They now trail leaders Montrose by four points but have three games in hand. The Balmoor side travel south of the border to face Berwick Rangers in midweek.